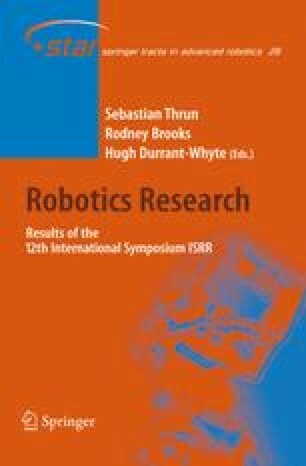 The main contribution of this paper is the reformulation of the simultaneous localization and mapping (SLAM) problem for mobile robots such that the mapping and localization can be treated as two concurrent yet separated processes: D-SLAM (decoupled SLAM). It is shown that SLAM can be decoupled into solving a non-linear static estimation problem for mapping and a low-dimensional dynamic estimation problem for localization. The mapping problem can be solved using an Extended Information Filter where the information matrix is shown to be exactly sparse. A significant saving in the computational effort can be achieved for large scale problems by exploiting the special properties of sparse matrices. An important feature of D-SLAM is that the correlation among landmarks are still kept and it is demonstrated that the uncertainty of the map landmarks monotonically decrease. The algorithm is illustrated through computer simulations and experiments.